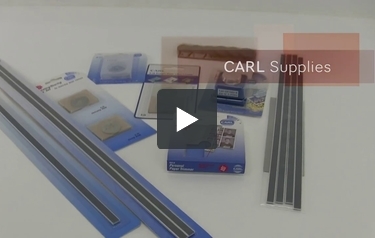 If you need a replacement blade for your Carl Trimmer, you've come to the right place. Here you can find a multitude of products compatible with various systems, so you can start trimming your materials to perfection again. We carry replacement blades with different styles and applications. Choose from straight, scoring, squiggle, perforation, scallop blades, and many, many more. Whether you need to trim sheets of paper, film, fabric or even felt, these blades will help you achieve the results you want, every time. And when they start to get dull, you know where to come to get your replacements at a great price! Handy cartridge design allows user to change or replace the blade without ever touching the sharp edge. Safety Cover Lever on Blade Cartridge to expose the blade.